Discussion in 'Food' started by Paulyseggs, Jan 13, 2019. So many dried things .Most in languages I dont speak or read . From lizards to octopus to animal dongs . Bins and bins of ginsing! I grabbed a few bagged things I'll post pics of when I get home. I gotta go back when I got more time and its not 10degrees . alukban, Bryan King, bacpacjac and 10 others like this. dried gecko . Used for medicine. alukban, bacpacjac, Crusher0032 and 7 others like this. Guillaume Longval, alukban, bacpacjac and 8 others like this. crunchy. Slighty spicy with a hint of sweet and saltyness . First one had a really bitter aftertaste .But its growing on me big time! Guillaume Longval, alukban, The Private and 11 others like this. They aint lyin either! Wooot! Both have a weird texture sensation I'm not used to . Eating shells . Guillaume Longval, alukban, bacpacjac and 9 others like this. The Snack that bites Back! Just got this impaled in the soft palate of the roof of my mouth! Guillaume Longval, alukban, Bryan King and 6 others like this. You’re a brave man. I was sort of fine until I saw the crab. I think the crunchy shell would make me nauseous. alukban, bacpacjac, Outdoor Dauber and 3 others like this. I wish had more time. My mom was doubled parked as I ran in and around this market . Sooo many shelf stable foods . Some of them look down right alien . alukban, bacpacjac, SoreFeet and 5 others like this. 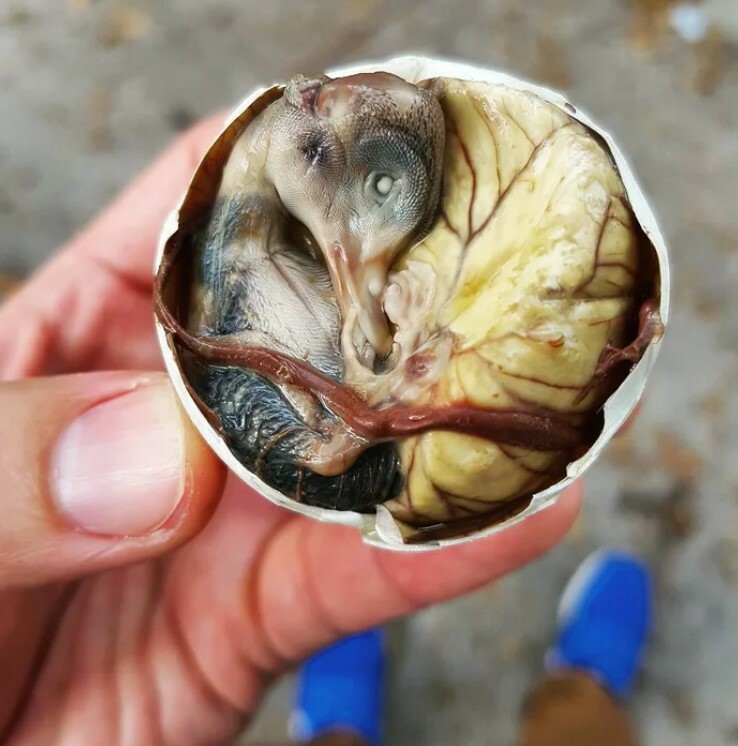 Any century eggs or balut? alukban, bacpacjac, Crusher0032 and 4 others like this. Probably. But EVERYTHING was in some asian language. No English subtitles. I really wanted to find a Durian. Found a box for frozen durian .But that was it. I need to go next time with my older daughter. And split from my wife and younger daughter. They look at shiny things while me and mini me look at tasty things! I'll need to bring xtra statins . Roasted duck and pork belly will not be passed! Ohh man! And the produce! Daikon the size of my arm . Dried mushrooms of all types . I need to find more markets! This is an interesting way of life . Hmm. Wonder if there are Middle Eastern markets too? Batman TV show music......TOO THE GOOGLER!! Guillaume Longval, alukban, bacpacjac and 4 others like this. Kimchi is good stuff. I never thought I’d like it, until I tried it. I’ve had the dried shrimp snacks. They were much smaller than the ones you pictured. I wasn’t terribly fond of them. Guillaume Longval, alukban, bacpacjac and 2 others like this. I hate those little shrimps with a passion. We need more restraint in preparing the foods we eat. Lettuce on enchiladas. Cheese on mashed potatos. It has to stop. More is not always better. I was in Hong Kong recently and left Singapore just the other day. I ate most of my meals in Chinatown there. I cannot think of a single thing to recommend that you find over there. I remarked how many of the restaurants I ate at were "You have to know a guy" good. Meaning that you would have to know a guy (in this case Chinatown in NYC) to approach Chinese food this good. Even then, I would have traded it for a slice of good pizza or esspecially a good steak in a minute. I don't think the roasted duck will be that good but there is no harm in trying it. That said, a good Chinese restaurant in NYC may have good pork. Good pork iz underrated and something worth enjoying and learning to prepare if possible. I would eat more pork if I could find it prepared well. As for packaged items, neither Chinsese nor the Middle Eastern markets I have been to in those regions had much that thrilled me. South Korea and Japan have more interesting snacks. Thailand has better spices and especially drinks (teas, milk teas, instant coffees, etc) which is what I really like. Sandcut, Guillaume Longval, alukban and 3 others like this. When I go to a new city, hands down my favorite place to visit is the market/grocery store. I'll try most things, but that duck eggs looks a little rough for me. alukban, bacpacjac, SoreFeet and 4 others like this. I just like weird stuff. alukban, bacpacjac and MrFixIt like this. Pretty cool although I gotta pass on the Balut. Not really my thing. I've picked up some pretty cool kitchen knives in Asian markets and in particular small choppers with serrated edges across the top for cutting through bone. Don't know what they are called but if you see one (pretty reasonable) they are quite versatile. When I lived in northern NJ, we'd shop in Chinatown fairly often. I still have several nice knives from a place on Mott St, I think it was. Grocery store on the ground floor and all kinds of kitchen stuff upstairs. Got to know our way around pretty well. I'd also shop along Canal St. on the Little Italy side, opposite Chinatown. There are some hardware and surplus type places that had some interesting items on occasion. I got some good files, a hammer from Sweden, stuff like that. There was a good Dim Sum restaurant on the Chinatown side. Big place on the second floor, probably still there. Very busy, full of Chinese. After we moved to Virginia, we went there when we were visiting family. On Canal St, we saw a family from VA that we knew. Our kids were school friends. Small world. alukban, bacpacjac, MrFixIt and 1 other person like this. I’m Chinese, but born and raised in Texas. My head exploded the first time I hit a Chinatown. alukban, USMCPOP, bacpacjac and 1 other person like this. I think I just threw up in my mouth a little... nope, it was a LOT!! I'm not opposed to trying new things, but mostly formed, unhatched ducks ain't happening. Not me. I'll give it a whirl . Worse thing that happens is you hurl . If I think of all the booze and food I left in gutters around the world . Thats a bit more nauseating than some half formed bird . alukban, bacpacjac and TrespassersWilliam like this. If it ever walked, swam, or flew in China, they have eaten it. I have been to the PRC many times and if you are not in a major city, try not to eat the “Western Food”. They have no more idea what real Western Food should taste like than we have about what real Chinese food should taste like. alukban, bacpacjac, Paulyseggs and 2 others like this. hunger truly is the best spice. remember that coup in Thailand? i was there. they invaded the airport and shut it down. wife and i got stuck there for an extra week. (the Thai gov paid our hotel and gave us food vouchers). we had to stay near the hotel. we were only allowed to go out to try to find transport out of country. in the night. we got the call, and packed fast! we jumped in a taxi and headed to the military airport. we had to sit there for 12 hours..waiting. some lady starts a fire right outside the airport and starts cooking meat..mystery meat. if i had to guess it some animals heart. she saw me watching her. i left and sat down. about sitting down: my wife and i SHARED a chair for 12 hours. if she had to get up, i had to sit down to hold it. vice versa. the airport had no bathrooms. they parked two buses at the lot and we had to use the bus bathrooms. trust me..we overloaded that toilet by 800%. it was awful. i pissed on the runway. anyways. that lady with the fire, she waded thru the crowd and found me. she gave me a skewer of meat. i tried to pay her, but she declined. i must have drooled or something as i watched her grill away. as a taller americanized chinese dude, i stood out like a beacon in that crowd. i have ZERO idea what that meat was, and her cleanliness practices..my wife and i scarfed that thing!! some countries like China developed their menus out of necessity. hunger. i'll never knock a countries cuisine ever. alukban, Paulyseggs, bacpacjac and 2 others like this. No one really eats that .....right? alukban and bacpacjac like this. Ni how, y'all. Er something like that. My wife was born in Thailand but first generation from north Vietnam. My ancestors were mostly German. Our kids were born in the US. I told them they were commie-nazis. Hard-headed bunch. I saw a whole big pile of those nearly hatched eggs being sold in a market in Bangkok 40+ years ago. As a science class project in high school, I had to incubate chicken eggs and bust them open and put the result in formaldehyde about every 3 days. I had about 8 baby food jars containing them for maybe 20 years, looked like new. At 65, I'm in pretty good shape. Some of the credit goes to inhaling formaldehyde while dissecting stuff in high school and college. alukban and Paulyseggs like this. I'd love to roam Asia . Eating my way as I go. Closest I've come is roomates. Lived with ALOT of different nationalities .Sometimes the only thing we had in common was food & and English to whatever dictionary. But have some awesome memories of passing around bowls of things I've never seen with a post it pad and a Webster's .Trying to figure out what the hell is going on! I'll never knock another person's food. I remember going to my first open air world market in Paris. I was with a chef instructor for Le Cordon Bleu. He gave me some advice as I stared at things in amazement. Kinda went like this . But it was 20years ago so I'm a little fuzzy. "If someone offers you something .Take it .Try it .Smile and say thank you . You don't have to eat it twice. But try it ." I spent 3 years in Thailand. Made a few short trips to Burma, Malaysia, Singapore and Indonesia. Bali was beautiful. Vietnam, Laos and Cambodia weren't open for business when I lived there. Next time I go, I'll visit my wife's sister in Vietnam. I'd love to rent a motorcycle and ride around the mountains in the north. We own a house in Loei, Thailand. Here's a view from a hilltop not far from our house. And a view of the hill from our porch. Your adventurousness is admirable but your durian inquisitiveness is gonna get you in ways you will not forget. I’d say enjoy but I’d be lying like a rug. Here are some Filipino kids roasting a pig for a feast their village threw for us. We were working on their school, which had been smashed by a typhoon. We (some US Navy sailors) brought hamburgers, hot dogs, etc for lunch but they fed us this instead. Really delicious! The ate up all the hamburgers and hot dogs. Win-win. i go as far to say if you make a scrunchy face, or a retching sound if someone shows you their food..i say that is kinda rude. you are kinda disrespecting something someone else likes. when i was a kid; grade-school lunches. i would eat the veggies. (my mom was always in my ear, good or bad) when i took a bite the entire table would "uuuggghhhh" in harmony. it felt bad..in japanese, they say "bad kimochee". its a bad feeling. i wouldnt eat my veggies at school purely from the peer pressure. looking back..i should have hiked my hike. i hope that entire table has high blood pressure and...ah..nevermind. bad kimochee. Sandcut, alukban and Paulyseggs like this. i'll add..that egg..the Balut. i would argue that is way less scary than the average American hotdog. .
@boomchakabowwow not any more. It was short lived . Did it maybe 5 or 6 years. Been a meatcutter the past 15 or so . Soon to be something else . Not sure what though . I no longer live to work. Gee, and I thought the bravest person in the world was he who ate the first raw oyster. Paulyseggs and alukban like this. I've had some good Thai durian. I liked it OK. I wouldn't eat it overripe. It's somewhat soft and rich, like custard that someone farted in. The smell didn't bother me, but I'm a smoker. No worse than an old fish market on a very hot day. It's somewhat soft and rich, like custard that someone farted in. Hahahhahahahhaha..that is the perfect description. i'm like you. i wont seek it out. but i ate a lot of it in South East Asia. it doesnt taste like it smells to me. Our house in Thailand has a jackfruit tree, which kind of resembles Durian. Huge fruits. If you look closely, that stuff is so good, it's eating itself! Seen a bizarre food episode from the Philippines one time. Bunch of people standing around including Andrew Zimmerman chowing down on them like crazy.